Sonya Kenin, now 19 years old, was not so long ago the younger player with the stellar resume battling the tour's veterans, as 15-year-old ITF World Junior No. 1 Whitney Osuigwe was today against Kenin in the first round of $100,000 Dow Tennis Classic. As the 16-year-old USTA National 18s champion, Kenin received a wild card into the US Open in 2015, losing in the first round to Mariana Duque-Marino of Colombia. 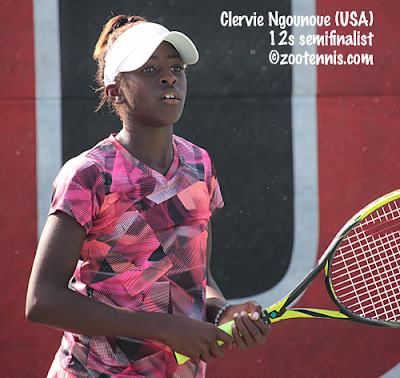 Osuigwe, who is just beginning a serious schedule of pro events after finishing 2017 as the ITF World Junior Champion, had reached her first pro circuit final Sunday at the $25,000 Wesley Chapel tournament, but her only previous experience at an event of this level was the US Open qualifying last year, where she lost in the first round. Kenin proved how valuable those three years of experience could be, beating Osuigwe 6-2, 6-3 in just over an hour in front of a spare Stadium court weekday crowd at the Greater Midland Tennis Center. "She's a great player, obviously," said Kenin, the No. 4 seed. "I knew I had to use my experience to play well. I knew I could handle it, if I focused on the match and not her age." Kenin was well aware of Osuigwe's resume. "She had a really great year, last year, the French Open champion, Eddie Herr, Orange Bowl, she's playing really well and she's got a lot of confidence," Kenin said. "She obviously thought she could do whatever she wanted to. She played well, but I just focused, I guess, a bit harder." A quarterfinal run at the ASB Classic in New Zealand, where she beat Jana Fett and Varvara Lepchenko before falling to Caroline Wozniacki in three sets, provided Kenin with a confidence boost of her own. "I've done a lot of fitness, I've improved my movement on the court and I'm serving much better," said Kenin, who did not face a break point against Osuigwe. "Today my serve helped me. I knew I could handle my serve. Before, I wasn't sure if I'd win my service games, but I felt confident today." Kenin will face Jamie Loeb in Thursday's second round, after Loeb beat Marie Bouzkova of the Czech Republic 6-4, 5-7, 6-3 in a two-and-a-half-hour slugfest. Loeb wasn't pleased with her serving, particularly in the second set, when she made only 40 percent of her first serves and double faulted four times. But it was one facet of the game where she had a definite advantage over Bouzkova, and she was determined not to abandon it. "I think I was serving pretty big when it was going in," said Loeb, the 2015 NCAA champion while a sophomore at North Carolina. "It was really effective, so I was sticking with it, saying keep going for it, even though I probably should have taken something off. But I figured it would come eventually, it was working the first set, but I'm glad it came back when I needed it." That was when she was serving a 4-3 in the third, getting a hold that ended a streak of four straight breaks. With Bouzkova, the 2014 US Open girls champion, serving to stay in the match at 3-5, Loeb got a first match point at 30-40, but netted a forehand after a long rally. She hit a forehand winner to earn match point No. 2 and didn't have to hit another ball, as Bouzkova double faulted to end it. Loeb, who had not played Bouzkova before, said she had heard she could step into the Bouzkova serve, but was not inclined to do too much more scouting before the match. "Sometimes, if I watch my opponent play beforehand, I over think and over analyze," said the 22-year-old New Yorker. "I knew what I wanted to do and I tried to execute that the best I could." Loeb and Kenin have played once on the USTA Pro Circuit, with Loeb winning 7-5, 6-2 in the semifinals of the $25K in Surprise Arizona, which Loeb went on to win. Only one of Tuesday's qualifiers were able to advance to the second round, with Katherine Sebov of Canada beating Lesley Kerkhove of the Netherlands 6-1, 6-0. Ann Li lost to No. 5 seed Sachia Vickery 7-6(4), 6-1 and lucky loser Usue Arconada lost a heartbreaker to Irina Bara of Romania 7-6(5), 7-6(4), with the two sets taking two hours and 31 minutes to play. Newport Beach WTA 125 champion Danielle Collins lost to Francoise Abanda of Canada 6-2, 6-2, with Abanda playing outstanding tennis and Collins unable to get her game on track. In the second set, Abanda hit eight consecutive first serves, won every point in those two games and had a 4-0 lead that Collins couldn't dent. Local juniors Ellie Coleman and Karina Miller received a main draw wild card into the doubles draw and acquitted themselves admirably in a 6-4, 6-4 loss to No. 2 seeds Bara and Mihaela Buzarnescu of Romania. While covering matches in Midland, I neglected to look at the new ITF junior rankings that included the Australian Open results and missed until yesterday that Sebastian Korda is now No. 1 in the boys rankings. Korda, who was previously No. 7, took over from Timofey Skatov of Russia. Osuigwe, who did not play the Australian Open, remains No. 1 in the girls rankings. 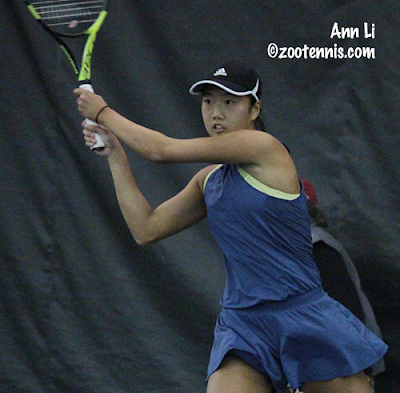 Ann Li decided to move on from junior tennis after the US Open Junior Championships last year. The 17-year-old, who has signed with LSU for the fall of 2018, had reached the Wimbledon girls final in July, and felt that in order to continue her improvement, she needed to play more on the next level. "I felt like it was time," said Li, who advanced to the main draw of the $100,000 Dow Tennis Classic Tuesday with a 6-4, 6-3 win over Paula Goncalves of Brazil. "I felt like I could hang with these girls and that I was at the same level." Li, who won her first Pro Circuit title at a $15,000 tournament shortly after her Wimbledon run and now has a WTA ranking of 588, believes the work she put in during her off-season helped her win three qualifying matches this week, two of them over Top 300 players. "I went through my first preseason in Orlando for a month or so and it was really tough," said Li, who is now living in the lodge there. "We did a lot of fitness. There was a little bit of tennis, but it was more just getting stronger and faster. I've been playing really well this week and it's more of me focusing on just being physical, grinding out points instead of going for something that was too risky or me not being aware of every ball. Using my legs and being physical, that's my goal. These last couple of matches, I've played good players and I feel really good, because I've just been tough and I can trust what I've done in preseason." Li won the first three games of the match against Goncalves, but when Goncalves raised her level of play, Li lost the next four games in a row. Goncalves double faulted on game point to give back the break, and after Li held for a 5-4 lead, Goncalves found herself down two set points at 15-40 and double faulted again. The second set saw only two holds of serve, both by Li, with seven breaks. "I felt good on my return and I didn't serve very well," said Li, who is being coached at the USTA by Jamea Jackson. "She took advantage of my second serve, because my first serve was low percentage, so I really tried to focus on getting my first serves in in that last game." Li is still planning to attend LSU this fall and hasn't set any specific ranking goals that would change that decision. "I've signed, so we'll see how this year goes," Li said. "I'm not really trying to focus on numbers right now. Whatever feels good, we'll see. It would be really fun to experience that[college]." Li will face No. 5 seed Sachia Vickery in the first round on Wednesday. Carol Zhao, who spent three years at Stanford before leaving after the Cardinal won the 2016 NCAA championship, won her first round match today at the Greater Midland Tennis Center, beating No. 6 seed Richel Hogenkamp 6-0, 6-1. The first game, with Zhao serving, was a bit of a struggle, but the 22-year-old Canadian held, then went on to win the next 10 games of the match before Hogenkamp got on the board. "The first game of the first round of any tournament is always going to be tricky," said Zhao, who is at a career-high WTA ranking of 143. "I thought I did a great job executing what I set out to do today, a couple things we've been working on the past couple of days, just staying solid on the first couple of balls and taking my opportunity when I see it during the point. So yeah, I'm very happy with my performance." Zhao earned the biggest title of her career last November at a $100,000 Pro Circuit event in China, which moved her into the Top 200 for the first time and changed the level of tournaments she could get into. "It made for a short offseason, that's for sure, but obviously I was excited to be going to bigger tournaments, Melbourne and obviously WTA events," said the 22-year-old, who trains with Cyril Saulnier at the Tennis Canada facility in Toronto. I think it led to a lot more motivation on my part, to continue doing better, to continue improving and climbing." Zhao, who grew up in Ontario, said she feels at home on indoor hard courts. "Growing up, this was our most prevalent surface in Canada, so obviously we're very comfortable on it," Zhao said. "Hopefully it's a bit of an advantage for us." Zhao admits to struggling in her first year on the WTA Tour. "I'm not anywhere close to where I want to be yet still," said Zhao who reached the NCAA singles final in 2015. "But obviously it's been a great last eight months. Coming out of college it's not easy to adjust to this whole new life. Even though I had an idea of what it was like from playing before college, dedicating your whole life to it and making it a career is a different thing. It just took some time for me to find my feet. Once I did, I'm just now really enjoying the process." Like former Stanford star Nicole Gibbs, who left school the year before Zhao started there, Zhao has another year of classes before she will get her degree. "We can go back whenever we want to and Gibbsy and I joke that we'll be class of 2030 together," said Zhao, who will experience team tennis again as a member of the Canadian Fed Cup team for next week's tie in Romania. In addition to Hogenkamp, another seeded player fell in the opening round of main draw Tuesday, with wild card Jessica Pegula defeating No. 7 seed Mariana Duque-Marino of Colombia 6-2, 6-1. Seventeen-year-old Bianca Andreescu of Canada, No. 8 seed Evgeniya Rodina of Russia and Stefanie Voegele of Switzerland also posted first round main draw victories. Qualfiers, in addition to Li, are Ulrikke Eikeri of Norway, Katherine Sebov of Canada and Jovana Jaksic of Serbia. Usue Arconada, who lost to Eikeri 6-3, 5-7, 6-1, received entry into the main draw as a lucky loser, with Irina Falconi withdrawing for medical reasons. Arconada will face Irina Bara of Romania in the first round Wednesday. 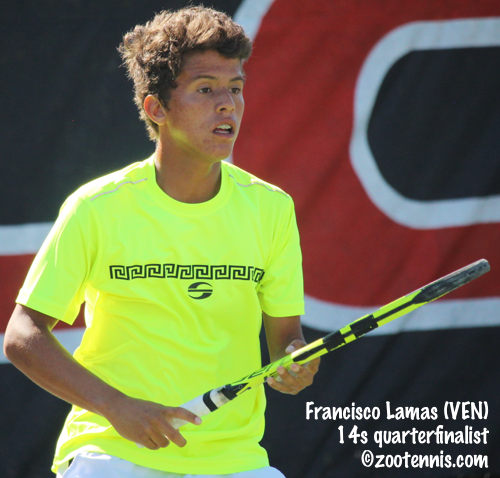 The Tennis Recruiting Network posted its 2018 Men's Winter Recruiting Class rankings yesterday, with Florida capturing the No. 1 spot. Texas A&M, Michigan, Princeton and Miami round out the top 5. This is the first of two rankings that will be done for the class of 2018, with the rankings in May likely to give a better picture of who will actually be on campus come next fall. I am one of the 20 college tennis aficionados who voted in this poll. For the second year in a row, former University of Virginia star Julia Elbaba has advanced to the final round of qualifying at the $100,000 Dow Tennis Classic, although she was unsure whether she would make the trip to Michigan after playing qualifying in a $60,000 ITF Women's Circuit event in France last week. "I honestly decided to come here the night before qualies," said the 23-year-old from New York. "I was the 12th alternate, really borderline. My mom asked me if I would be more upset if I go and don't get in, or staying home when you would have gotten in. I said staying home; it's about taking chances." On Sunday, Elbaba defeated former USC star Giuliana Olmos of Mexico 7-5, 6-3 and followed that today with a 6-3, 6-4 win over top qualifying seed Daniela Seguel of Chile. "I've been serving and returning better," said Elbaba, who graduated from Virginia in 2016. "That's something I really focused on in the preseason that definitely translated into the match today. I played more aggressive, I think she likes to grind, as a girl from Chile, that's just my guess. I made sure to move in as much as I could and finish points at the net." Elbaba, who won the 2014 National Intercollegiate Indoor Championships while at Virginia, admits indoor hard courts are a favorite of hers. 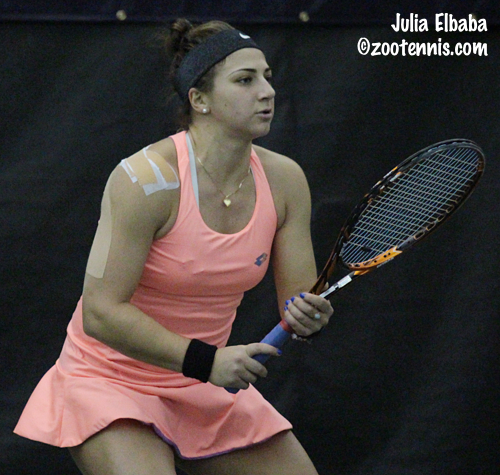 "Obviously I won a nice title on college on the indoor hard courts, so I always carry that little momentum into every indoor tournament I play," said Elbaba, who suffered a fracture in her hand while training last winter that kept her off the tour for several months. "I was just feeling it out there, and I felt it here last year as well." Elbaba will face unseeded Jovana Jaksic of Serbia in the final round of qualifying, after Jaksic defeated former University of Michigan star Emina Bektas, the No. 8 seed, 6-7(6), 6-1, 7-5. Seventeen-year-old Ann Li advanced to the final round of qualifying with a 4-6, 6-1, 6-4 win over Cristiana Ferrando of Italy, who had taken out No. 2 seed Maria-Teresa Torro-Flor of Spain in the first round. Li broke Ferrando for a 5-3 lead and hung on, saving a break point in the final game with a good first serve. Li had been unable to convert her first two match points, but she claimed her third, with a big forehand that forced an error from her 22-year-old opponent. Li will play Paula Goncalves of Brazil, who beat 18-year-old Maria Mateas 6-3, 6-2. The only two seeds remaining in the draw will play each other on Tuesday morning, with No. 7 seed Usue Arconada facing No. 3 seed Ulrikke Eikeri of Norway. Eikeri breezed past Hanyu Guo of China 6-2, 6-1, while Arconada came from a set down to defeat Sophie Chang 3-6, 6-3, 6-0. Arconada, who is currently enrolled at LSU and trained there last week, but is taking her classes online, needed over three hours to get past Michelle Larcher de Brito of Portugal in Sunday's first round. "I had a long match yesterday with de Brito, I was moving a lot and running a lot and it was a tough three-setter," said the 19-year-old. "So my legs were a little gone at the beginning today, my rhythm wasn't really there and I wasn't moving as well. But in the second set, she kind of gave me a little break, she wasn't feeling her serve a lot, so I tried to take advantage of that and be more aggressive. I got myself ready and mentally going more, and in the third set I started to be more aggressive, go for more. I played well." The fourth final round qualifying match on Tuesday will feature Karolina Muchova of the Czech Republic against Katherine Sebov of Canada. The main draw has been released with wild card Whitney Osuigwe drawing No. 4 seed Sonya Kenin. The Newport Beach WTA 125 champion Danielle Collins has drawn Francoise Abanda of Canada. Mihaela Buzarnescu of Romania and Jennifer Brady are the top two seeds. The ITF Grade 1 in Colombia finished last night, and I apologize for not being able to keep up with it. There was no live scoring and many late night matches, so I was always behind in reporting. American Lea Ma, the No. 6 seed, reached the final again, after making the final the week before in Costa Rica, and again she fell to top seed Maria Osorio Serrano of Colombia. Osorio Serrano took the final 6-2, 6-2 this week, after Ma had beaten unseeded Gabby Price in the semifinals and Kacie Harvey in the quarterfinals. Angelica Blake and Harvey, the No. 6 seeds, lost in the doubles final to Mylene Halemai of France and Adrienn Nagy of Hungary 6-2, 7-5. Three US boys made the quarterfinals: Tyler Zink, Alex Lee and Eliot Spizzirri. For the second straight week an unseeded French boy won a Grade 1 title, with Arthur Cazaux defeating No. 2 seed Mateus Alves of Brazil 7-5, 6-7(4), 6-2. 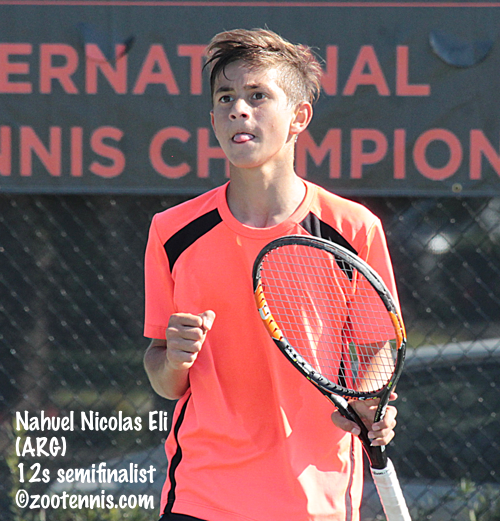 Nicholas David Ionel of Romania and Sebastian Rodgriuez of Peru won the boys doubles title, beating No. 2 seeds Facundo Diaz Acosta and Agustin Riquelme Coppari of Argentina 6-3, 6-1. The fields are set for the ITA National Team Indoor Championships. Complete women's results can be found at the ITA tournament page. Complete results from the men's Kickoff Weekend can be found at the ITA's tournament page. 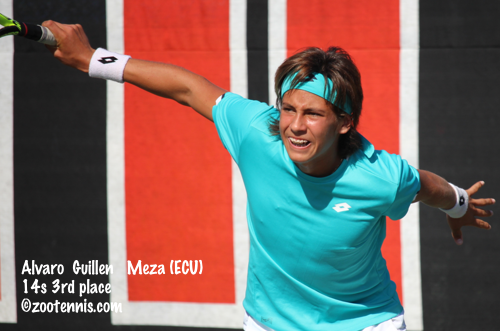 Victor Lilov won Les Petits As title today in Tarbes France, defeating top seed Mikhail Gorokhov of Russia 6-4, 7-6(1). Lilov, who was seeded fifth despite his title last week at Bolton, was serving down 1-4 15-40 in the first set. He recommitted himself to move aggressive tactics and closed the net often and Gorokhov was making too many unforced errors to hang with the 13-year-old from Raleigh, NC. Lilov actually won six games in a row, breaking Gorokhov to start the second set, but he gave the break back immediately and fell behind 5-3. But Gorokhov couldn't get to a set point, and in the subsequent tiebreaker, Lilov played well, while Gorokhov made error after error, eliminating the possibility of a third set. Lilov is the fourth American to win both Bolton and Les Petits As in the same year. The others are Frances Tiafoe (2012), CiCi Bellis(2013) and Donald Young(2003). The only loss for Lilov in the two major Tennis Europe events was in the final of the Bolton doubles, as he and Evan Wen won the Les Petits As doubles title yesterday. Unseeded wild card Alexandra Eala of the Philippines became the first player from her country to win a Les Petits As title, beating No. 7 seed Linda Noskova of the Czech Republic 5-7, 6-3, 7-6(5). Noskova served for the match at 5-4 in the third, but Eala crushed two second serve return winners and her way to an easy break. In the final set tiebreaker, Noskova went up 2-0, then lost six straight points, with a double fault among the points she donated. But the 13-year-old fought back, saving three match points before she finally sent a forehand wide. 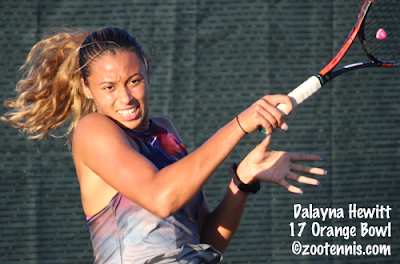 At the $25,000 USTA Women's Pro Circuit event in Wesley Chapel Florida, 20-year-old Francesca Di Lorenzo defeated 15-year-old qualifier Whitney Osuigwe 6-2, 1-6, 6-4. It is the former Ohio State star's third Pro Circuit title, the second at the $25,000 level, while Osuigwe was playing in her first Pro Circuit final at any level. At the Oracle Challenge series in Newport Beach California, Danielle Collins and Taylor Fritz took the titles with come-from-behind victories. 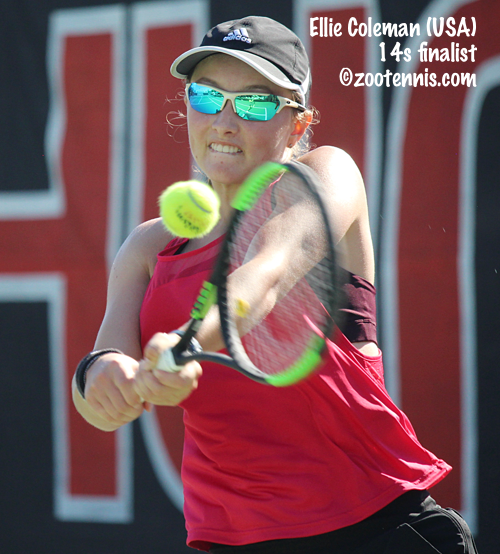 Collins, the two-time NCAA champion while at Virginia, defeated qualifier Sofya Zhuk of Russia 2-6, 6-4, 6-3, after trailing 5-0 in the first set and 2-0 in the second set. It's the biggest win of the 24-year-old Floridian's career and will move her WTA ranking to around 120, a career high. Fritz, the No. 3 seed, defeated Bradley Klahn 3-6, 7-5, 6-0 in the men's final. Fritz wasted several opportunities to take control of the second set, but he finally seized one with Klahn serving at 5-6, and rolled through the third. Klahn had 10 double faults and only three aces, while Fritz had 8 aces and two double faults. Fritz will rise to around 76 in the ATP rankings. Collins and Fritz now take the lead in the Oracle Challenge, which is a competition for American players for a main draw wild card into the BNP Paribas Open in Indian Wells. The American man and women with the most points accrued in this tournament and the next one late next month in Indian Wells will be awarded a main draw wild card. Twenty years after his father Petr won the men's singles title on Rod Laver Arena at the Australian Open, 17-year-old Sebastian Korda captured the boys title on the same court, defeating Chun Hsin Tseng of Taiwan 7-6(6), 6-4. Korda, the No. 7 seed, fell behind 2-0 in both sets, and he trailed No. 6 seed Tseng 5-2 in the tiebreaker. After holding both his serves for 5-4, Korda got the mini-break back with a forehand winner on the outside half of the sideline, but he went down a set point at 6-5, only to save it with a great first serve. Two rare unforced errors by Tseng gave Korda the set, with Korda's serve--he had 9 aces and was serving in the 120s--and his composure during the most pressure-packed points the key to his win. In the second set, Korda broke back immediately after going down 2-0 and broke Tseng again at 2-2 with a perfectly executed forehand winner doing the job. Serving out a junior slam can be tricky, especially for someone who had never been beyond the third round of a junior slam previously, but Korda showed no sign of nerves, starting with an ace and closing it out on his first match point at 40-15, when Tseng missed a backhand. Korda gave a delayed scissor kick, his father's signature celebration, and spoke of how happy he was to give his father a late birthday present and his mother an early one. Korda is only the third American boy in the Open Era to win the Australian Open, joining Andy Roddick (2000) and Donald Young (2005). For more from Petr Korda on his son's run to the final, see this article from the ATP website. For an interview with Sebastian, see this from the ATP. No. 2 seed En Shuo Liang became the first girl from Taiwan to win a junior slam singles title, defeating unseeded Clara Burel of France 6-3, 6-4 in the final. The 17-year-old Liang, who is on a 18-match ITF Junior Circuit winning streak, also won the girls doubles title. She and Xinyu Wang of China, the No. 1 seeds, defeating No. 7 seeds Violet Apisah of Papua New Guinea and Lulu Sun of Switzerland 7-6(4), 4-6, 10-5. 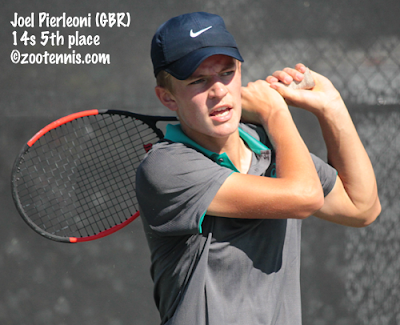 For more on Saturday's finals, see the ITF Junior website. Victor Lilov reached the final of Les Petits As with a 6-3, 6-3 win over doubles partner Evan Wen and will face top seed Mikhail Gorokhov of Russia for the prestigious 14-and-under title. Lilov, seeded fifth, showed off some excellent volleys, and handled Wen's big serve well. Lilov defeated No. 8 seed Wen last week in the Bolton final, although that match went three sets. Gorokhov defeated No. 7 seed Matthew Donald of the Czech Republic 6-2, 6-0. Katja Wiersholm fell in the semifinals, with the No. 5 seed falling to No. 7 seed Linda Noskova of the Czech Republic 6-2, 6-2. Noskova, not as physically mature as many of the girls of that age, served well and made very few errors despite playing aggressively. Wiersholm's lefty serve did not bother Noskova much, and with Wiersholm's unforced error count high, Noskova posted a relatively easy win. 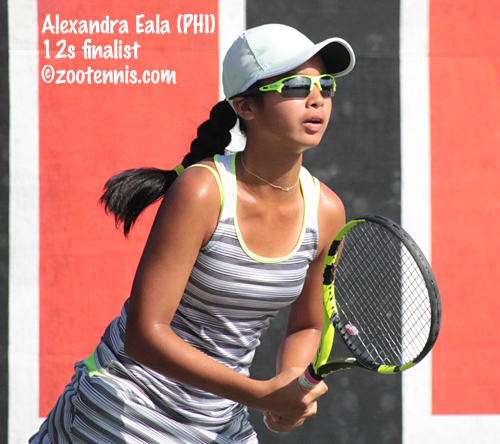 She will face unseeded wild card Alexandra Eala of the Philippines, who defeated no. 13 seed Katerina Dimitrova of Bulgaria 6-1, 6-3. 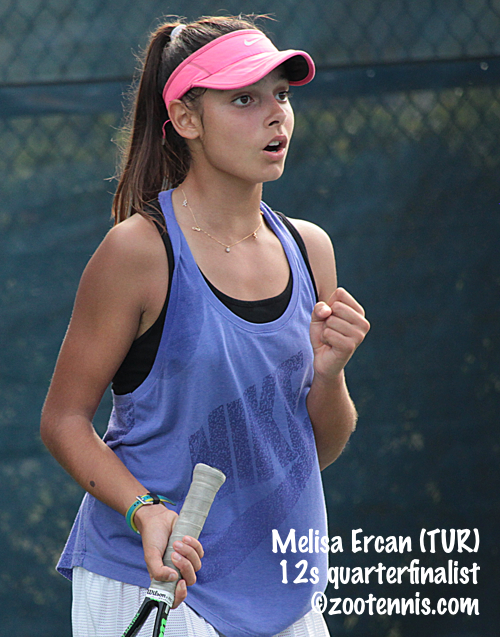 Eala, who turned 13 this month, reached the Junior Orange Bowl 12s final in December. I'm not certain the finals will be live streamed, but if they are, it will be via this page on the tournament website. Whitney Osuigwe and Francesca Di Lorenzo will meet in the final of the $25,000 USTA Women's Pro Circuit tournament in Wesley Chapel Florida after both posted straight-sets wins today. The 15-year-old Osuigwe, playing in her first tournament since winning the Orange Bowl early last month, defeated No. 2 seed and WTA No. 183 Irina Bara of Romania 7-6(3), 6-4 for her seventh consecutive straight-sets win, including three in qualifying. Di Lorenzo, who defeated top seed Anhelina Kalinina of Ukraine in Friday's quarterfinals, beat 17-year-old Olga Danilovic of Serbia 6-3, 6-1. Osuigwe will be playing in her first Pro Circuit final, while Di Lorenzo, who left Ohio State recently after her sophomore year, will be playing in her fourth at the $25,000 level. She won one of those, back in 2016. 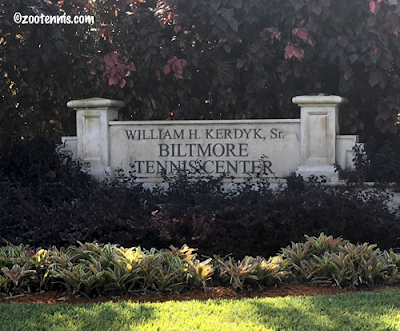 The ITA Division I Kickoff Weekend is underway at sites across the country, although rain has been a problem at some locations. See the ITA tournament page for links to results, with the winners heading to Seattle(men) and Madison Wisc(women) for the National Team Indoor Championships next month. Defending men's champion Virginia is already out, losing to Texas Tech 4-3 in Charlottesville today. Defending women's champion Florida is into the final in Gainesville, the Gators will face University of Louisiana-Monroe Sunday. Last month at the Junior Orange Bowl, I had an opportunity to talk with Kent Kinnear, the USTA Director of Player ID and Development. Sectional, regional and national camps are a big part of how the USTA connects with competitive 14-and-under players across the country, and he explained how the system is organized, how coaches are selected and what happens at one of the two- or three-day camps. The Team USA initiative continues with strong support throughout the USTA, and I hope this interview for the Tennis Recruiting Network provides some background on how that concept has been implemented over the past several years. Sebastian Korda defeated No. 2 seed Marko Miladinovic of Serbia 7-5, 5-7, 6-4 Friday to advance to the final of the Australian Open junior championships Saturday. The 17-year-old Floridian, who is the first American to advance to the Australian Open boys final since Stefan Kozlov in 2014, will play No. 6 seed Chun Hsin Tseng of Taiwan on Rod Laver Arena. The match will be streamed live, beginning at 9 p.m. Eastern tonight, via ESPN3. Korda's match with Miladinovic was decided by razor-thin margins, with just three breaks of serve in the entire match. Miladinovic was cruising on serve in the first set until he served at 5-6. 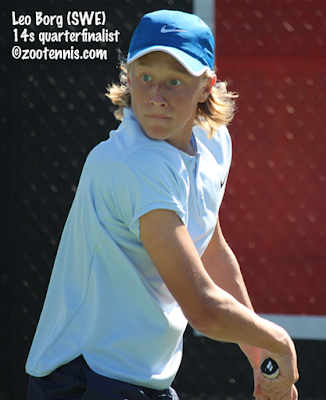 At 15-all he made two rare unforced errors and a forehand winner by Korda sealed the set. In the second set, Miladinovic had a tougher time holding serve but saved the only break point he faced, while converting his second break point against Korda, when Korda netted a forehand at 5-6, 30-40. The third set was more of the same through the first six games, but Korda broke Miladinovic at love to take a 4-3 lead. Serving for the match at 5-4, Korda went up 40-0, but wasn't able to get any of those three match points. But staying calm, he earned a fourth and closed it out on that one to become the first US boy since Tommy Paul and Taylor Fritz at the 2015 US Open to advance to a junior slam final. For more on Korda, see the ITF junior website. Tseng defeated unseeded Aidan McHugh of Great Britain 6-3, 5-7, 6-4 and will be seeking the first ever Australian Open boys title for his country. Tsung-Hua Yang (2008) and Yeu-Tzuoo Wang (2001) did reach the finals. The girls final will feature unseeded Clara Burel of France against No. 2 seed En Shuo Liang of Taiwan. Burel won the final 12 games of the match against top seed Xinyu Wang of China in her 2-6, 6-1, 6-0 semifinal win, while Liang saved two match points in her 4-6, 6-3, 7-6(5) win over unseeded Elisabetta Cocciaretto of Italy. Like Halep, who will be playing Wozniacki for the women's title tonight, Liang has saved match points in two different matches; she was down a match point in the first round against wild card Olivia Gadecki of Australia. The boys doubles title went to No. 7 seed Hugo Gaston and Clement Tabur of France, who beat Rudolf Molleker and Henri Squire of Germany 6-2, 6-2. 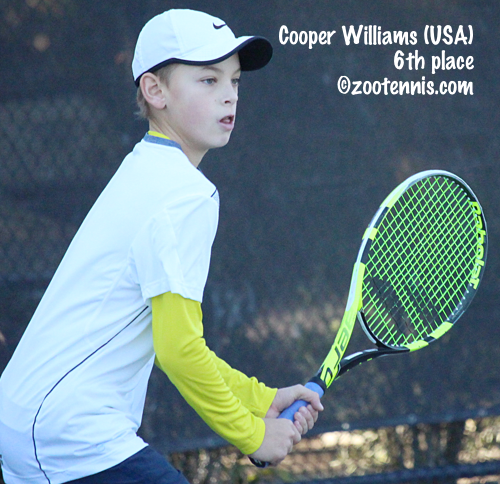 At Les Petits As, the major 14-and-under tournament in France, three Americans have advanced to Saturday's semifinals, with No. 5 seed Victor Lilov and No. 8 seed Evan Wen scheduled to meet again for the second week in a row. Lilov defeated Wen last week in the final of the Tennis Europe Category 1 tournament in Bolton England. 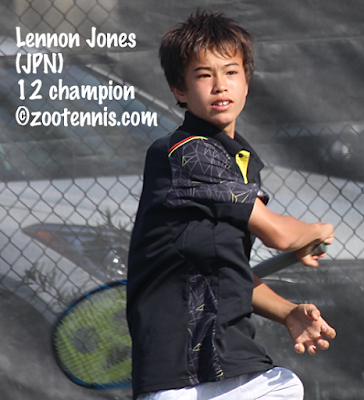 Lilov defeated unseeded Jaden Weekes of Canada 6-4, 6-7(3), 6-4 in today's quarterfinals, while Wen took out No. 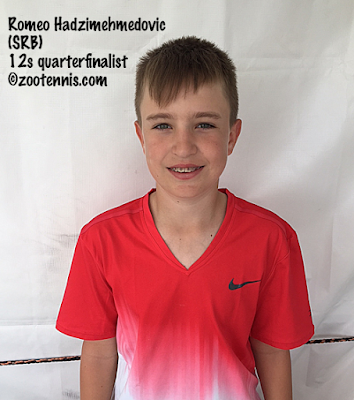 2 seed Konstantin Zhzhenov of Russia 5-7, 6-4, 6-2. Wen and Lilov advanced to the boys doubles final, after the No. 5 seeds beat unseeded Bartol Borse and Luka Mikrut of Croatia 6-0, 6-2. They will face unseeded Niccolo Ciavarella and Daniele Minighini of Italy. In the girls draw, Bolton champion Katja Wiersholm was at the top of her game today, beating No. 15 seed Maria Sholokhova of Russia 6-0, 5-0 ret. I didn't get up in time to see either of the boys matches, but I did seed Wiersholm's on the live stream, and she was using her lefty advantage to perfection throughout the match, both when serving and in finding angles on her ground strokes. In the semifinals, Wiersholm will play No. 7 seed Linda Noskova of the Czech Republic, who beat top seed Diana Shnaider of Russia 6-3, 6-1. The other girls semifinal will feature No. 13 seed Katerina Dimitrov of Bulgaria against unseeded Alexandra Eala of the Philippines, who was a finalist at the Junior Orange Bowl 12s last month. Wiersholm and Robin Montgomery lost in the doubles final to Noskova and Linda Fruhvirtova 7-6(6), 6-3. A couple of young Americans picked up big wins today at the $25,000 USTA women's Pro Circuit event in Wesley Chapel Florida. Fifteen-year-old qualifier Whitney Osuigwe won her sixth straight match, beating 18-year-old Katie Swan of Great Britain 6-3, 6-4. Osuigwe, the ITF Junior No. 1, will face No. 2 seed Irina Bara of Romania in the semifinals Saturday. It was also announced today that Osuigwe has been awarded a wild card into next week's $100,000 Women's Pro Circuit event in Midland Michigan. I am again planning to spend a couple of days at the tournament, so I hope I am able to see her opening round match. The the Midland tournament notes are here. So back to Wesley Chapel, where former Ohio State star Francesca Di Lorenzo ended the winning streak of top seed Anhelina Kalinina of Ukraine in a three-hour plus marathon 5-7, 6-4, 6-3. 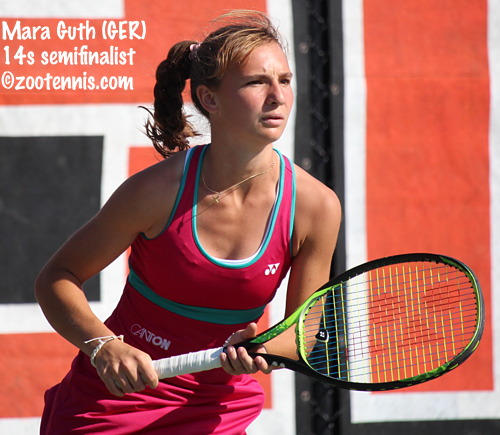 The 20-year-old left-hander will face 17-year-old left-hander Olga Danilovic of Serbia in the semifinals Saturday. At the Oracle Challenger tournaments in Newport Beach California, three US men and one US woman have advanced to the semifinals. No. 3 seed Taylor Fritz, the only seed to reach the quarterfinals, beat Noah Rubin 6-3, 6-2, avenging his loss to Rubin in the Noumea Challenger final earlier this month to advance to the semifinals. Fritz will play friend and frequent doubles partner Reilly Opelka, who beat Matthias Bachinger of Germany 7-5, 6-4. One of the best junior matches I've seen in the past three or four years was Fritz vs Opelka in the semifinals at the 2015 Wimbledon Junior Championships, which Opelka went on to win. Bradley Klahn also advanced to the semifinals, beating 2017 ITF Junior Champion Miomir Kecmanovic of Serbia 7-6(7), 6-1. He will face qualifier Christian Garin of Chile in the semifinals. Danielle Collins, who received a wild card into the tournament, advanced to the semifinals with a 6-0, 3-6, 6-4 win over Su Jeong Jang of Korea. Collins, a two-time NCAA singles champion while at Virginia, will play No. 7 seed Ajla Tomljanovic of Croatia, who beat two-time NCAA singles champion Nicole Gibbs 4-6, 7-5, 6-2. In the bottom half, two qualifiers are into the women's semifinals: Mayo Hibi of Japan and 18-year-old Sofya Zhuk of Russia, the 2015 Wimbledon girls champion. They will play each other on Saturday. No. 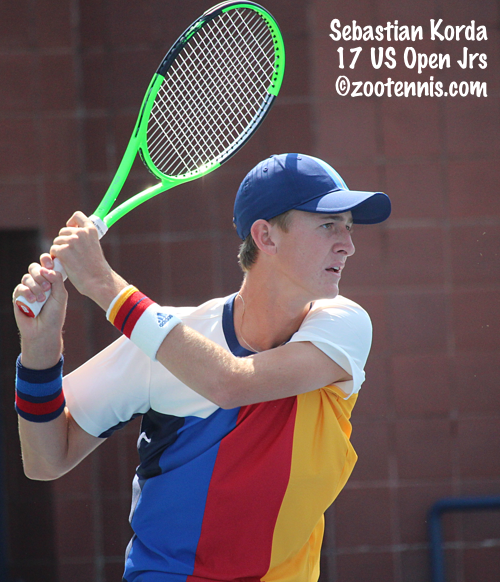 7 seed Sebastian Korda has advanced to the semifinals of the Australian Open Junior Championships, defeating unseeded Ray Ho of Taiwan 6-2, 6-3 in Thursday's quarterfinal. Korda had ten aces, 28 winners and 18 unforced errors in a dominating performance. 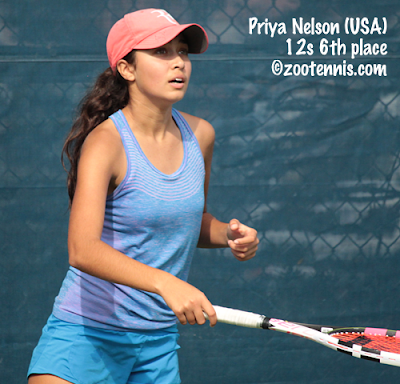 The 17-year-old from Bradenton Florida will play No. 2 seed Marko Miladinovic of Serbia, who ended the 15-match winning streak of No. 5 seed Hugo Gaston of France 4-6, 6-3, 7-5. Korda is the first American boy to advance this far since Stefan Kozlov reached the final in 2014. Top seed Timofey Skatov of Russia was beaten by No. 6 seed Chun Hsin Tseng of Taiwan 2-6, 6-3, 6-2 and will face unseeded Aidan McHugh of Great Britain, who defeated unseeded wild card Rinky Hijikata of Australia 6-4, 6-2. 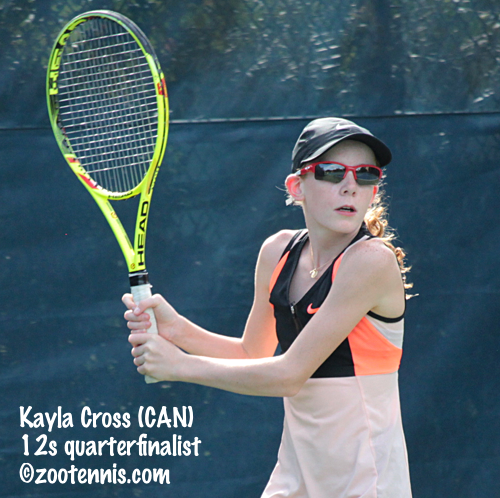 Dalayna Hewitt was unable to join Korda in the semifinals, with the 17-year-old from Ohio falling to unseeded Clara Burel of France 7-6(4), 6-2. Hewitt fought back from a break down to force the first set tiebreaker, but Eddie Herr finalist Burel was able to return Hewitt's serve better than previous opponent's had and made few errors down the stretch. Burel will face top seed Xinyu Wang of China, who won her third consecutive three-setter, beating No. 5 seed Naho Sato of Japan 5-7, 6-3, 6-3. Unseeded Elisabetta Cocciaretto of Italy will face No. 2 seed En Shuo Liang of Taiwan in the other girls semifinal. Cocciaretto defeated No. 13 seed Daniela Vismane of Latvia 6-3, 6-4, while Liang defeated Xiyu Wang of China 6-4, 4-6, 6-3. Liang and Xinyu Wang will play in the girls doubles final Friday with the top seeds facing No. 7 seeds Violet Apisah of Papua New Guinea and Lulu Sun of Switzerland. The boys doubles final will feature No. 7 seeds Gaston and Clement Tabur of France against the unseeded German team of Rudolph Molleker and Henri Squire, who received entry as alternates. At Les Petits As, three of the four Americans in today's third round action advanced to the quarterfinals, including both Bolton champions: Katja Wiersholm and Victor Lilov. 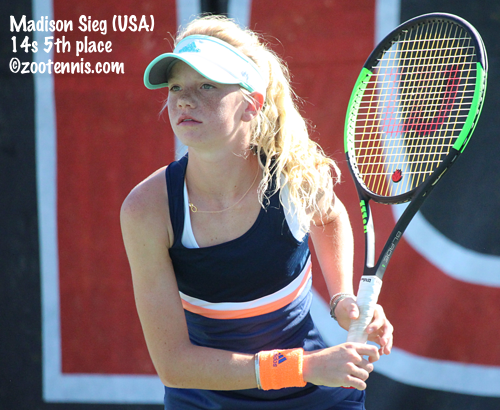 Wiersholm, seeded fifth, defeated Junior Orange Bowl 12s champion Linda Fruhvirtova of the Czech Republic 6-3, 7-5; Lilov, also seeded fifth, beat qualifier Luka Mikrut of Croatia 6-3, 6-3. No. 8 seed Evan Wen advanced with a 6-1, 6-2 victory over unseeded Patrick Brady. Robin Montgomery fell to top seed Diana Shnaider of Russia 6-3, 7-5. Wiersholm will face No. 15 seed Maria Sholokhova of Russia in Friday's quarterfinals, with Lilov taking on unseeded Jaden Weekes of Canada and Wen meeting No. 2 seed Konstantin Zhzhenov of Russia. Wiersholm and Montgomery will play in Friday's girls doubles final against Fruhvirtova and Linda Noskova; Wen and Lilov advanced to the boys doubles semifinals. Live streaming and live scoring is available at the tournament website. 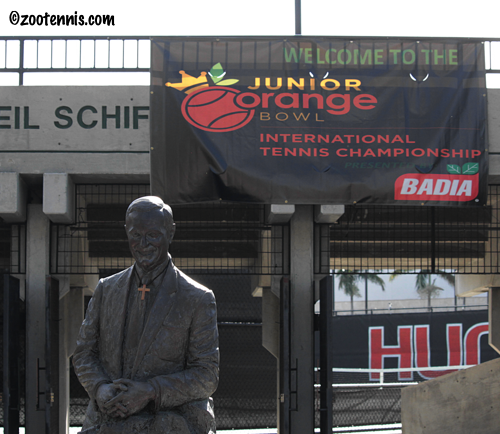 With Les Petits As winding up, it's beyond time for me to post the last of the photos and videos from the Junior Orange Bowl last month. Below are the photos of the 14s top finishers and short videos of the the 14s finals. The United States has no more men or women in singles at the Australian Open, with Madison Keys and Tennys Sandgren falling in the quarterfinals Wednesday, but two Americans have reached quarterfinals in the junior championships: Sebastian Korda and Dalayna Hewitt. (The Bryan twins are also through to the men's doubles semifinals). Korda came back to defeat South African qualifier Philip Henning 4-6, 6-1, 6-4 and will face another unseeded player, Ray Ho of Taiwan, Thursday. 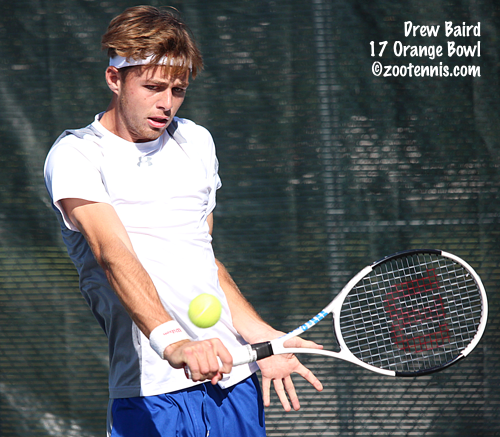 Drew Baird, the other US boys to reach the round of 16, lost to Australian wild card Rinky Hijikata 6-4, 6-3. Like Baird, Hewitt played on a large show court due to the opponent being Australian, but she didn't let that affect her. 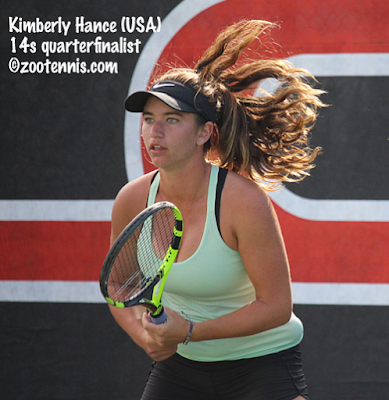 The 17-year-old from Ohio used her serve to bail herself out of any tight spots in her 7-5, 6-2 win over wild card Amber Marshall. She will play Eddie Herr finalist Clara Burel of France, who came back to beat No. 12 seed Elysia Bolton 6-7(1), 7-6(5), 6-4. Bolton served for the match at 6-5 in the second set, but was broken at 15-40; in the tiebreaker, she double faulted at 5-5 and Burel took advantage. It is the first junior slam quarterfinal for both Korda and Hewitt. Two other girls quarterfinals have an Asian emphasis. Top seed Xinyu Wang of China survived her second consecutive three-setter, beating Mananchaya Sawangkaew of Thailand 6-4, 4-6, 6-2. She will face No. 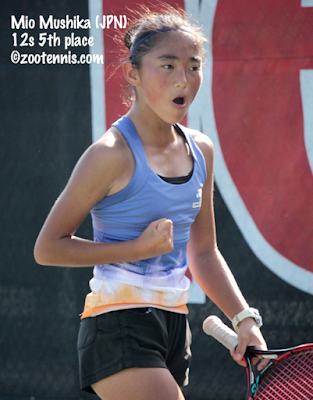 5 seed Naho Sato of Japan, who beat Lulu Sun of Switzerland 7-6(5), 6-7(5), 6-1. Wang beat Sato in their only ITF Junior Circuit meeting back in 2015. No. 9 seed Xiyu Wang of China eliminated No. 7 seed Alexa Noel 6-3, 7-5, with her power keeping Noel on defensive throughout much of the match. Wang will face No. 2 seed En Shuo Liang of Taiwan, who beat No. 16 seed Kamilla Rakhimova of Russia 2-6, 6-4, 6-4. Liang and Wang have played four times, with Liang winning them all, including in the three-set final of the Grade 1 in Traralgon last week. The other girls quarterfinal features unseeded Elisabetta Cocciaretto of Italy and No. 13 seed Daniela Vismane of Latvia, who split their two previous meetings last year. Taiwan is the country with the most players left in the junior singles, with Liang and two boys: Ho and No. 6 seed Chun Hsin Tseng. Tseng will play top seed Timofey Skatov of Russia, who overcame a first-set shutout to defeat unseeded Yanki Erel of Turkey 0-6, 7-5, 6-3. Skatkov and Tseng haven't met in ITF Junior Circuit competition, but Tseng did defeat Skatov in the 2015 final of Les Petits As. Unseeded Aidan McHugh of Great Britain faces Hijikata and No. 2 seed Marko Miladinovic of Serbia will play No. 5 seed Hugo Gaston of France, who is now on a 15-match winning streak. None of the boys quarterfinalists have met in ITF Junior competition before. Hewitt, with Peyton Stearns and Korda, with Colombia's Nicolas Mejia, lost their quarterfinal doubles matches Wednesday, so all Americans are out of those two draws. At Les Petits As, two US boys and two US girls remain after two rounds of singles action. No. 5 seed Victor Lilov won his second straight match from a set down today, beating Kalin Ivanovski of Macedonia 6-7(7), 6-0, 6-1. No. 8 seed Evan Wen defeated Hamza El Amine of Morocco 6-3, 6-4. Jonah Braswell lost to No. 6 seed Mili Poljicak of Croatia 4-6, 6-3, 6-3. No. 5 seed Katja Wiersholm defeated Hanne Vandewinkel of Belgium 7-5, 6-4 and will play unseeded Linda Fruhvirtova of the Czech Republic next. 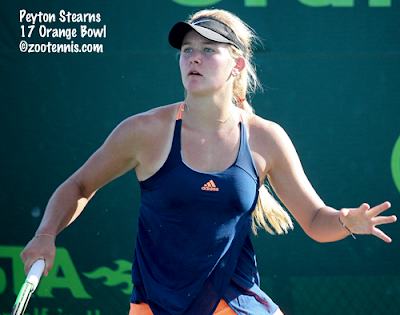 Fruhvirtova reached the Eddie Herr 14s final and won the Junior Orange Bowl 12s last month. Robin Montgomery beat No. 14 seed Sarah Mueller of Germany 6-3, 6-2 and will face top seed Diana Shnaider of Russia next. Katrina Scott, the No. 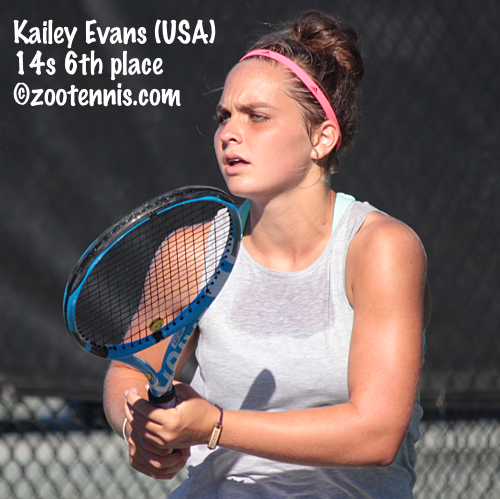 8 seed, lost to Kyoka Kubo of Japan 6-1, 5-7, 6-0. No. 2 seed Erika Andreeva of Russia was beaten by Sofia Costoulas of Belgium 6-4, 7-5 to set up a rematch of the Junior Orange Bowl 12s semifinal last month with Alexandra Eala of the Philippines, which Eala won 7-5, 7-6(3). Montgomery and Wiersholm, who won the title last week in Bolton, are through to the semifinals in doubles. Wen and Lilov will play their doubles quarterfinal match on Thursday. The ITA released their Division I team rankings today, and for the second week in a row, there were no changes in the Top 10 from week 1's rankings. That will certainly change after the ITF Kickoff weekend which starts Friday. Five Americans will play in the third round Wednesday at the Australian Open Junior Championships, after the second round concluded Tuesday with wins by No. 7 seed Sebastian Korda, No. 12 seed Elysia Bolton and unseeded Dalayna Hewitt. Korda had no trouble at all with Eddie Herr champion Adrian Andreev of Bulgaria, cruising to a 6-2, 6-1 win 51 minutes. Hewitt, who reached the semifinals of the Grade 1 in Traralgon the previous week before withdrawing, continued her excellent play with a 6-3, 6-3 win over qualifier Moyuka Uichijima of Japan. Bolton fell behind Himari Sato of Japan 3-1 in the opening set, but served well the remainder of the match to close out the victory. Qualifier Jaycer Lyeons had three set points to force Orange Bowl and Traralgon champion Hugo Gaston of France to a third set, but the fifth-seeded Gaston saved them all serving at 5-6. 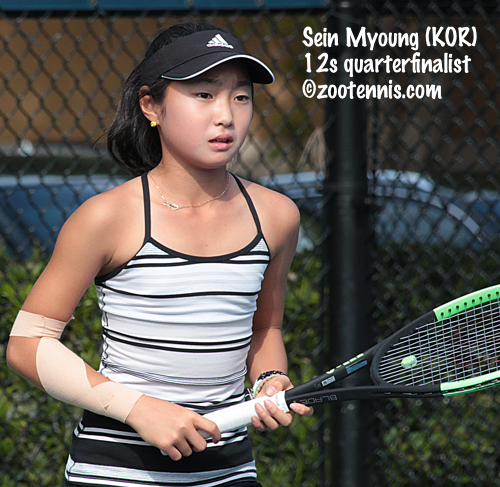 Lyeons also had a 4-2 lead in the tiebreaker before Gaston won the last five points of the match. Peyton Stearns gave top seed Xinyu Wang of China a tough battle, but she was unable to hold serving at 4-5 in the third set. No. 7 seed Alexa Noel is the only one of the five Americans remaining who is facing a seed in the third round; she plays No. 9 seed Xiyu Wang of China. Stearns and Hewitt have advanced to Wednesday's doubles quarterfinals, as has Sebastian Korda, who is playing with frequent partner Nicolas Mejia of Colombia. Madison Keys and Tennys Sandgren are in action Wednesday in the quarterfinals, with both matches early enough to be viewed in prime time in the United States tonight. Keys plays Angelique Kerber of Germany and Sandgren faces Hyeon Chung of Korea. The first round is complete at Les Petits As in Tarbes France, with six of the eight Americans in the draw advancing to the second round. Katja Wiersholm, Katrina Scott and Robin Montgomery won, with Eddie Herr champion Vivian Ovrootsky going out in the opening round. Victor Lilov, Evan Wen and Jonah Braswell won their first round matches, with John Kim losing his opener. The top two seeds in both the boys and girls draws, all of whom are from Russia, also advanced to the second round. The Tennis Europe tournament page also has draws and the schedule for Wednesday. Streaming is available at the tournament's website. Many of the Americans who played last week's Grade 1 Coffee Bowl in Costa Rica have moved on to the Grade 1 in Barranquilla Colombia. The seeded US boys are Tyler Zink, Coffee Bowl finalist Keenan Mayo, Emilio Nava, Eliot Spizzirri, Will Grant, Tomas Kopczynski, Nathan Han and Ronan Jachuck. The top seed withdrew, so Mateus Alves of Brazil, the No. 2 seed, is the highest remaining seed in the boys draw. Coffee Bowl champion Maria Osorio Serrano of Colombia took a wild card into the tournament and is the No. 1 seed. US girls seeded are Vanessa Ong, Sabina Dadaciu, Coffee Bowl finalist Lea Ma, Shelly Yaloz, Sanyukta Gawande, Kacie Harvey and Addison Guevara. The girls draw is 48, with all the seeds receiving first round byes, while the boys draw is 64. 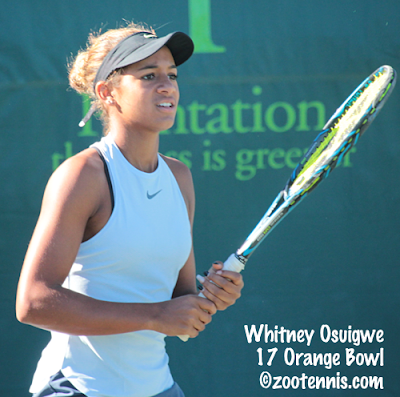 ITF World Junior Champion Whitney Osuigwe qualified for the main draw of the $25,000 USTA Women's Pro Circuit event in Wesley Chapel today, by beating Ohio State recruit Isabelle Boulais of Canada 6-2, 7-5. The 15-year-old, who is playing her first tournament since winning the Orange Bowl last month, defeated Mayuka Aikawa of Japan and Catherine Harrison(UCLA) in straight sets in the first two rounds of qualifying. Sanaz Marand(North Carolina) is the only other American to reach the main draw. 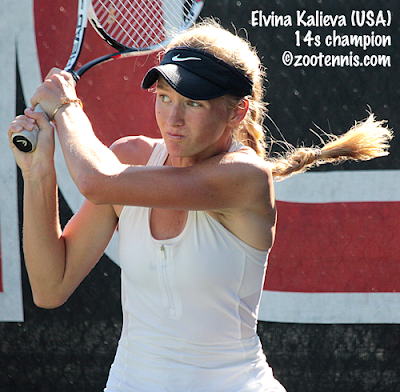 Daytona Beach and Orlando $25K champion Anhelina Kalinina is again the No. 1 seed this week. Professional tennis journalists and commentators have been searching for a more unlikely slam quarterfinalist than Tennys Sandgren, but they are having a tough time coming up with nominees. The 26-year-old Sandgren, who had won only two ATP level matches in his career and won his first slam match last week in Melbourne, defeated No. 5 seed Dominic Thiem of Austria 6-2, 4-6, 7-6(4), 6-7(7), 6-3 at the Australian Open Tuesday, his second Top 10 win of the tournament. Sandgren, who played at the University of Tennessee from 2009-2011, has equaled the performance of current Tennessee head coach Chris Woodruff, who was the Tennessee assistant when Sandgren was a Volunteer. Woodruff reached the Australian Open quarterfinals back in 2000. Sandgren will face 21-year-old Hyeon Chung, who pulled off a surprise of his own, beating six-time Australian Open champion Novak Djokovic 7-6(4), 7-5, 7-6(3). For more on Sandgren's win, see this article from the Australian Open website. Madison Keys is a much more likely quarterfinalist, with the 2017 US Open finalist setting up a meeting with Angelique Kerber of Germany with a 6-3, 6-2 win over France's Caroline Garcia. For more on Keys' overpowering performance Monday, see this article from the WTA website. Two of the four American juniors in action on Monday advanced to the third round, with No. 7 seed Alexa Noel at the top of her game in a 6-2, 6-0 win over Mariam Dalakishvili of Georgia. Drew Baird had a much tougher battle with qualifier Jesper De Jong of the Netherlands, but he pulled out a tense 3-6, 6-4, 7-6(6) victory. Five Americans are in action Tuesday, with the most intriguing match that between Eddie Herr champion Adrian Andreev of Bulgaria and No. 7 seed Sebastian Korda. All junior matches can be streamed via WatchESPN. 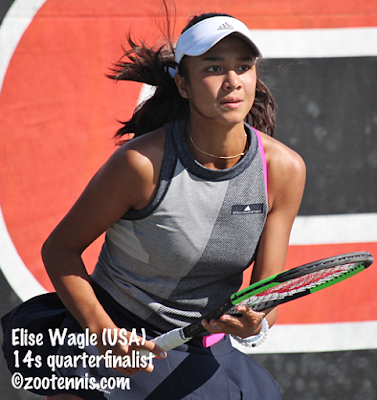 There are again two USTA Pro Circuit events in Florida, a women's $25,000 tournament in Wesley Chapel, and a men's $15,000 Futures in Weston, but the big event in the US this week takes place in Newport Beach California, a part of the new Oracle Challenge Series*. Qualifying for the $150,000 men's Challenger was completed today, with Stanford senior Tom Fawcett, a wild card, advancing to the main draw, along with Dennis Novikov(UCLA). 2016 ITF World Junior Champion Miomir Kecmanovic of Serbia beat No. 2 seed Frances Tiafoe 6-4, 3-6, 6-3 in today's first round. Noah Rubin and Stefan Kozlov have advanced to the second round. Kei Nishikori, who is coming back from injury, is the top seed and plays Novikov in the first round. At the women's WTA 125 event, qualifying finished on Sunday, with reigning US Open girls champion Amanda Anisimova reaching the main draw and then advancing to the second round with a 6-1, 3-0 ret. win over Irina Falconi today. Anisimova had not played since the WTA 125 event in Hawaii last November. Kayla Day and wild card Claire Liu picked up wins over WTA veterans Mariana Duque-Marino of Colombia and Stefanie Voegele of Switzerland respectively, with wild card Vicky Duval also advancing to the second round. *About the Oracle Challenger Series – The Oracle Challenger Series was created to offer American tennis players more opportunities and builds on Oracle’s commitment to help support U.S. tennis for men and women at both the collegiate and professional level. The Series will feature equal prize money in a groundbreaking tournament format that combines the ATP Challenger Tour and WTA 125K Series. Five American juniors picked up wins Sunday at the Australian Open Junior Championships, giving the US nine players in the second round, which begins Monday (Sunday night in the US). Dalayna Hewitt overpowered No. 4 seed Maria Carle of Argentina 7-6(5), 6-4 for the biggest upset among them, but the most dramatic win was Peyton Stearns 6-1, 6-7(6), 7-6(7) win over Gergana Topalova of Bulgaria. Stearns trailed 6-2 in the final tiebreaker before winning five straight points. Topalova saved that match point, but not the next one, and Stearns will face top seed Xinyu Wang of China on Tuesday. Sebastian Korda is the subject of this feature from AP, which mentions that father Petr Korda, who won the Australian Open men's title in 1998 and often travels to international junior tournaments, is not with him in Australia. The ITF junior website has an update on Orange Bowl and Traralgon Grade 1 champion Hugo Gaston of France, who has now won 16 ITF Junior Circuit matches in a row. Jaycer Lyeons def. Yeongseok Jeong(KOR) 3-6, 5-5, ret. After a huge number of singles entries--54--at the ITF Grade 1 Coffee Bowl, the US contingent had to settle for two doubles titles last night in Costa Rica. Top seed Maria Osorio Serrano of Colombia defeated No. 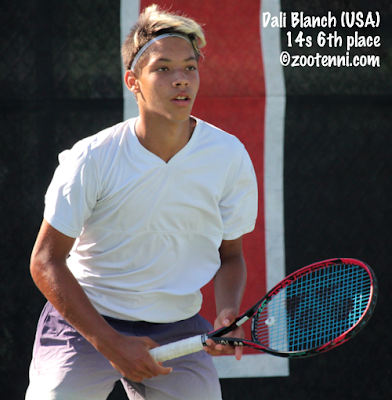 7 seed Lea Ma 6-3, 5-7, 6-3 and unseeded 15-year-old Harold Mayot of France beat No. 7 seed Keenan Mayo 7-5, 6-2. Mayo had won the doubles title prior to the singles final. He and Tomas Kopczynski, the No. 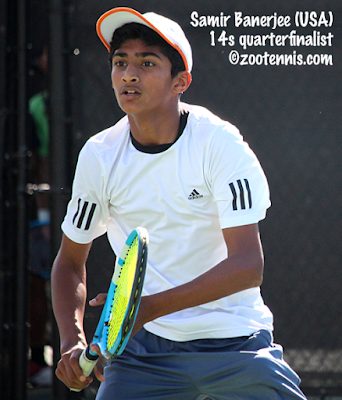 4 seeds, beat top seeds Govind Nanda and Tyler Zink 6-4, 6-4. Unseeded Kylie Collins and Shelly Yaloz won the girls doubles title, beating unseeded Natsumi Kawaguchi of Japan and Shavit Kimchi of Israel 6-1, 6-3. 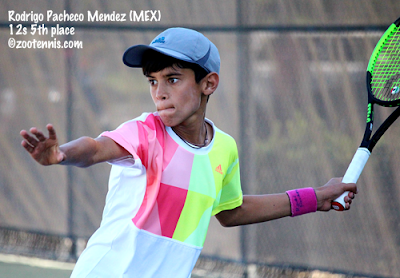 At the ITF Grade 5 in Anguilla, 15-year-old Spencer Brachman won his second singles title, with the No. 4 seed beating unseeded Casper Christensen of Norway 6-1, 6-2 in the final. Brachman won his first ITF singles title back in November at the Grade 5 in Antigua. Fourteen-year-old Taylor Cataldi, playing in her first ITF tournament, swept the girls titles. She beat Rachel Caplan 6-1, 6-2 in the all-US final and partnered with Genevieve Quenville of Canada for the doubles title. The unseeded Cataldi and Quenville defeated No. 2 seeds Payton Saca and Australia's Luciana Kunkel 1-6, 6-4, 10-7 in the final. Top seeds Quinn McLeod and Puerto Rico's Rafael Grovas won the boys doubles title, beating No. 3 seeds Timothy Phung and Japan's Toi Kobayashi 6-1, 6-4. 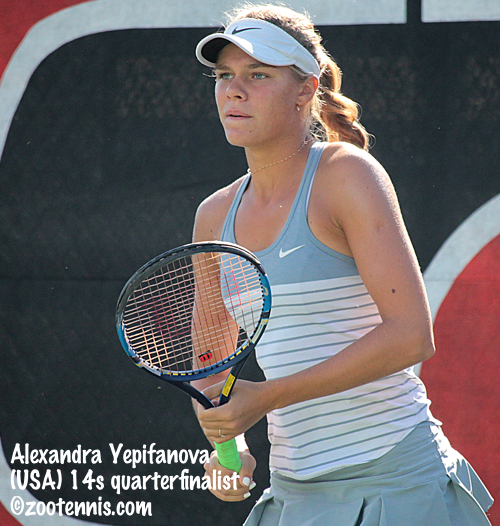 The finals of the two USTA Pro Circuit events in Florida this week did not produce any American champions. 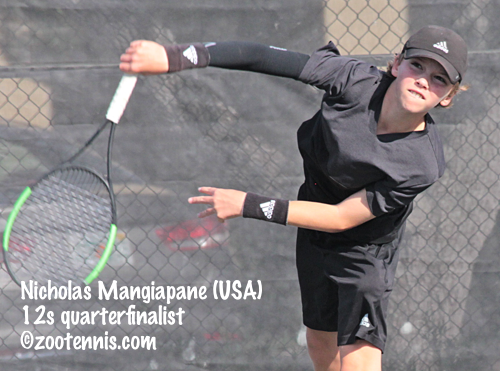 At the $15,000 Futures in Sunrise, Julien Cagnina of Belgium, the No. 2 seed, beat Naoki Nakagawa of Japan 6-7(5), 6-3, 6-3 to win the singles titles. Cagnina and Maxime Chazal of France won the doubles title, beating Junior Ore(Texas A&M) and Juan Benitez Chavarriaga(Baylor) 1-6, 7-5, 10-4. At the $25,000 women's tournament in Orlando, Anhelina Kalinina of Ukraine won her second straight event, with the top seed beating unseeded Julia Grabher of Austria 6-2, 3-6, 7-5. Hanyuo Gao of CHina and Ching-Wen Hsu of Taiwan won the doubles title, beating Ulrikke Eikeri of Norway and Ilona Kremen of Belarus 6-3, 3-6, 12-10 in the final. The Les Petits As tournament begins Monday in Tarbes France, with Bolton champions Katja Wiersholm and Victor Lilov the top seeded Americans, both at No. 5. Lilov is still being shown as from Bulgaria, but that is not correct. Katrina Scott and Evan Wen, finalists in Bolton, are both seeded No. 8. Robin Montgomery, Vivian Ovrootsky, John Kim and Jonah Braswell are not seeded. 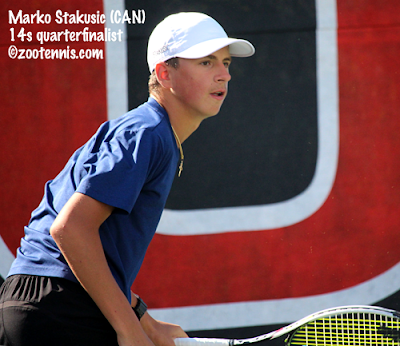 The top boys seed is Mikhail Gorokhov of Russia; the No. 1 seed in the girls draw is Diana Shnaider, also from Russia. 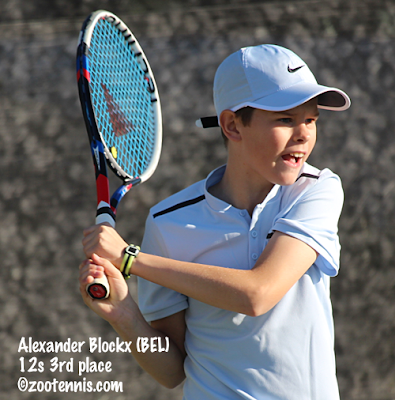 Printable draws can be found at the Tennis Europe tournament page. Monday's schedule features three US girls: Wiersholm, Scott and Ovrootsky. Keenan Mayo and Lea Ma, both No. 7 seeds, will play in their first Grade 1 finals tonight at the Coffee Bowl in Costa Rica. Ma defeated No. 9 seed Alexandra Vagramov of Canada 6-3, 6-4 in last night's semifinals and will face top seed Maria Osorio Serrano of Colombia in tonight's final after Orsorio Serrano defeated No. 4 seed Elli Mandlik 6-4, 6-2. Mayo's big serving helped him win a hard-fought battle with No. 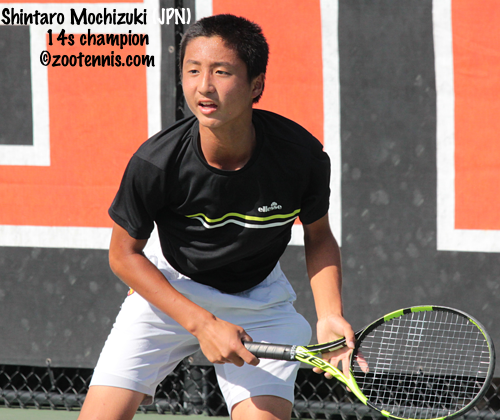 8 seed Brandon Nakashima 6-4, 6-7(4), 6-4, earning him a meeting with 15-year-old Harold Mayot of France. Mayot cruised past No. 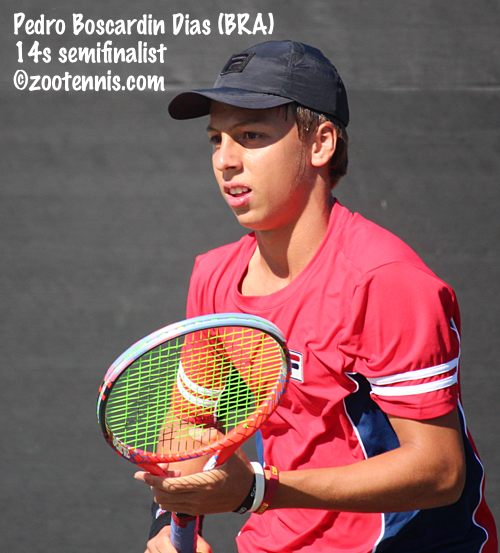 3 seed Mateus Alves of Brazil 6-2, 6-1 late last night. Before he plays in the singles final, Mayo will play for the doubles championship with partner Tomas Kopczynski, with the No. 4 seeds taking on top seeds Govind Nanda and Tyler Zink in an all-American final. The unseeded team of Kylie Collins and Shelly Yaloz will face unseeded Natsumi Kawaguchi of Japan and Shavit Kimchi of Israel for the girls title. See the tournament website for live streaming. 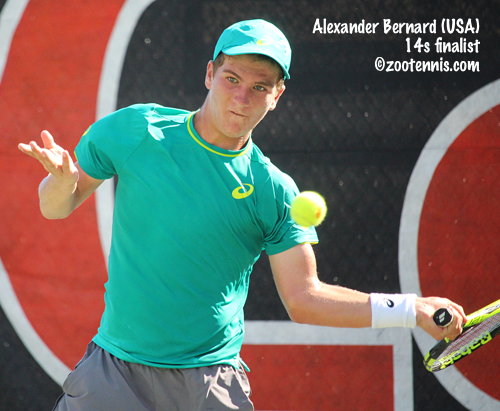 The first day of the Australian Open Junior Championships saw Americans go 4-2. US Open finalist Coco Gauff suffered the first first round exit of her brief ITF Junior Circuit career, losing to unseeded Elisabetta Cocciaretto of Italy. Sunday's schedule includes eight more American first round singles matches, as well as first round doubles matches. There are no US girls seeded in doubles, but interesting to note that Marta Kostyuk, who reached the third round in the women's draw this week, is in the girls doubles draw with Viktoriia Dema, also of Ukraine. They are seeded fourth. In the boys doubles draw, Tristan Boyer, playing with Argentina's Juan Cerundolo, is seeded No. 5, and Sebastian Korda, playing with longtime partner Nicolas Mejia of Colombia, is seeded No. 2. Sandy Harwitt spoke with Alexa Noel about her first junior slam win in this feature for the ITF junior website. Just two Americans have advanced to the second week of the Australian Open, No. 17 seed Madison Keys and Tennys Sandgren. Keys is no surprise, of course, having reached the final of the last slam, but Sandgren won his first grand slam match Tuesday, so his run has been unexpected. Here's a tennis.com feature on Sandgren, who will face No. 5 seed Dominic Thiem of Austria next. And hats off to Lauren Davis, who fell just short in an epic match with No. 1 seed Simona Halep of Romania 6-4, 4-6, 15-13. For more on that, see the WTA website. I've been working on the Junior Orange Bowl photos and videos, and today's post features the 12s division. I've been writing an annual Intriguing Questions article for the Tennis Recruiting Network for 13 years now, with this year's edition available today. I cover ATP/WTA format changes, ITF junior points changes, UTR, live streaming and other topics, including what 2018 holds for Whitney Osuigwe and the 20-year-old American men. I am always struck, after I've written this article, how many of these big-picture questions are a result of conversations I've had with players, coaches and administrators during my five weeks in Florida at the end of the year. That suggests a recency bias, but I believe that preparation for and curiosity about a new year's changes is also a factor. I hope you learn something from reading it; I always learn something during my research before writing it. For the second year in a row, the United States has swept the titles at the Tennis Europe Category 1 tournament in Bolton England. Thirteen-year-old Katja Wiersholm, whose brother Henrik reached the final of the same event back in 2011, avenged her loss to No. 2 seed Katrina Scott in the final of the USA Les Petits As playoff last fall with a 6-4, 6-4 victory. Wiersholm, the No. 5 seed, beat the No. 4, No. 1 and No. 2 seeds in succession for the title. Coco Gauff, then 12 years old, won the girls title last year over Alexandra Yepifanova, also of the United States. No. 7 seed Victor Lilov also avenged a recent loss to his doubles partner Evan Wen, after the No. 4 seed had beaten him at a USTA tournament in Cincinnati. 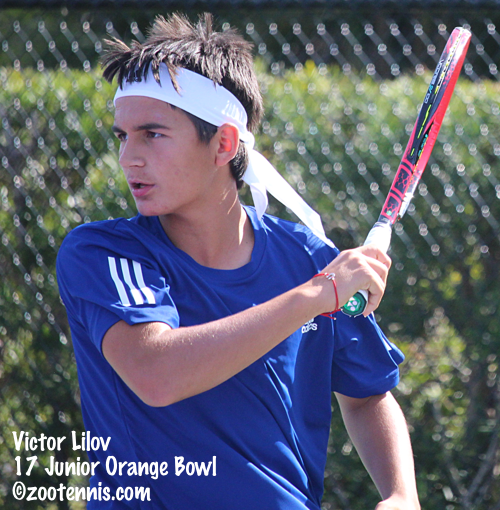 The 13-year-old Lilov had come from a set down in both his quarterfinal and semifinal victories, and he went three sets again today against Wen in a 6-3, 0-6, 6-3 win. Toby Kodat won the boys title last year over Martin Damm, also of the United States. The next stop for the USTA's 14-and-under team is Tarbes France, where the Les Petits As tournament will begin on Monday. At the ITF Grade 1 Coffee Bowl in Costa Rica, No. 8 seed Brandon Nakashima defeated top seed Trey Hilderbrand 4-6, 7-6(5), 6-4 to reach his first Grade 1 semifinal. The 16-year-old from San Diego will play No. 7 seed Keenan Mayo later tonight. The other boys semifinal features No. 3 seed Mateus Alves of Brazil and unseeded 15-year-old Harold Mayot of France. Alves defeated No. 6 seed Tyler Zink 6-4, 3-6, 7-5 in the quarterfinals last night. No. 4 seed Elli Mandlik will play top seed Maria Osorio Serrano of Colombia this afternoon, after Osorio Serrano breezed past Chloe Beck 6-2, 6-0. No. 7 seed Lea Ma will face No. 9 seed Alexandra Vagramov of Canada in the other semifinal tonight. Streaming will begin around 6:30 p.m. Eastern at the tournament's website. The draws are out for the Australian Open Junior Championships, which begin Saturday (Friday night in the United States) with eight American girls and six American boys participating. The fields are similar to those of the Traralgon Grade 1 this week, although the No. 1 seed in the girls draw, Xinyu Wang of China, did not play there, as she won a wild card tournament and played in the women's main draw in Melbourne. Timofey Skatov of Russia is again the No. 1 boys seed this week. The US boys in the draw are Sebastian Korda, Andrew Fenty, Tristan Boyer, Drew Baird, Sangeet Sridhar and qualifier Jaycer Lyeons, who did not play Traralgon. The US girls in the draw are Alexa Noel, Elysia Bolton, Hurricane Tyra Black, Coco Gauff, Peyton Stearns, Nicole Mossmer, Dalayna Hewitt and qualifier Niluka Madurawe. Streaming of junior matches should be available via WatchESPN. Ryan Harrison lost to No. 6 seed Marin Cilic of Croatia last night, leaving Tennys Sandgren as the last US man in the draw.